As much as I’d like to visit every corner of the Earth, I’m well aware that’ll probably never happen. Unlike a certain friend of mine, visiting every country in the world is not one of my actual goals. Because I’m more into travel for the romance of it all, I’m going to have to visit some far-off places vicariously, living through the eyes of others. Take North Korea, for instance. I’m fascinated by the place, but I’ll never go there. I’ve read a couple of books about this insular nation, watched a handful of documentaries, and eagerly devour each new article I find. This shot was taken at the Mass Games, a 100,000 person choreographed performance of simultaneous dancing and gymnastics on the field of Pyongyang’s May Day stadium. 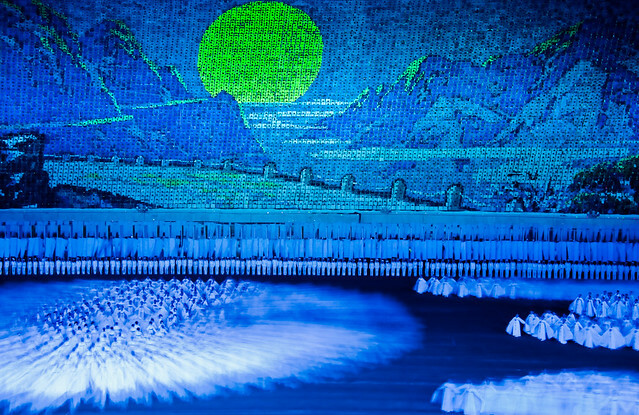 The image in the background of the mountain is made up of 30,000 “pixels” which are constantly being changed into new images, each pixel by a different Korean kid. Each time they turn the page to create a new giant picture, they cry out, mixing the shout with the noise of thousands of pages turned at the same moment. A 3-second exposure. Women soldiers practicing their marching. 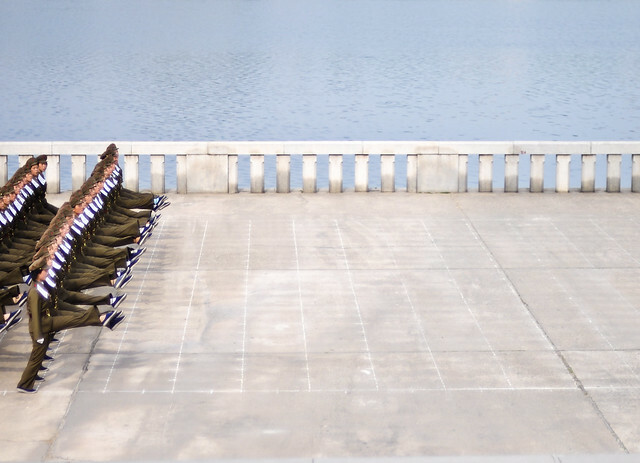 For all the soldiers in North Korea, it’s strange that there’s really no war at all. Still the country has one of the largest militaries in the world. And they spend much of their day marching and chanting anti-American and anti-Japan songs. There seemed to be about as many women as men in the army, though that was just observation. I think for a 18 year old, it seems there’s not a whole lot else to do. 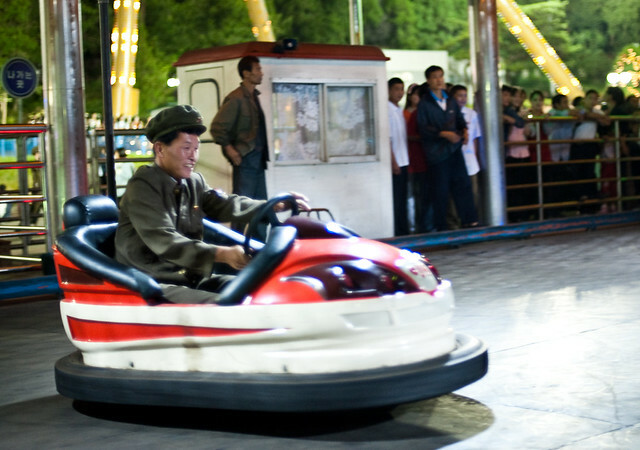 Not much of a shot for image quality, but playing this bumper car game with the DPRK soldiers was one of the highlights of my trip to North Korea. Went head to head with them, nothing but laughs. A few were with their kids in the same car. Good times had by all. You can view all of Gellman’s North Korea photos on Flickr. Though I doubt I’ll ever visit North Korea myself, I do hope to visit southeast Asia in the next couple of years. But first, I have a couple of dates with South America! (I’m hiking through the Andes from Cuzco, Peru to Machu Picchu as you read this.) And maybe in 2012, I’ll even visit Turkey and (fingers crossed) Antarctica. Further reading: Gellman’s travel photography is beautiful. You can see more at his website or in his Flickr stream. Previous post: How Much Spanish Do You Need in Peru?